May I first take this opportunity to wish all our members and non members a happy Christmas (yes it’s only 3 weeks away) and a very happy new year. May I also take this opportunity on be half of all the committee members to thank all members for there continued support. Without you shipmates there would be no association. The last committee meeting was held in Bristol on 25th November. In attendance were Peter Philips, Tanzy Lee, George Roche, Spider Webster and Dave Bracken. Apologies from Steve Bullock who could not attend due to changes in routine. (Remember those good old days). The proposed date for next years re – union in Chester is Saturday 18th November 2006. As Chester town hall is currently under a period of refurbishment as yet this venue cannot be guaranteed. An alternative venue in Chester is currently being looked into should the town hall not be available. A letter has been sent to Chester council asking for a completion date and a final decision will be made at the next committee meeting scheduled for February 2006. Details will then be published on the web-site and included in the spring issue of the newsletter. 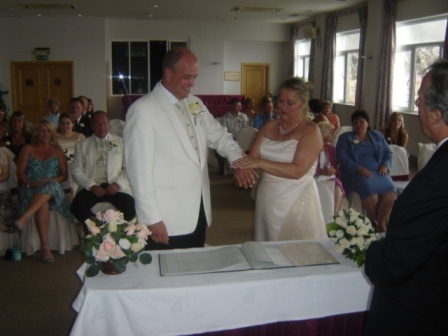 Congratulations to Billy Billingham and Zena on their recent marriage in Gibraltar. The occasion was attended my many of the associations members and by all accounts it was quite a few days. I have published a couple of the photos; more are available to view on the website. 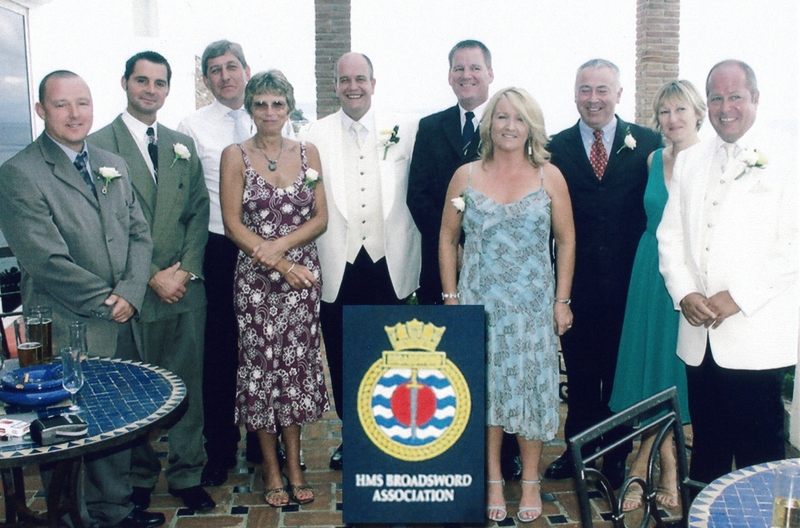 The Broadsword Association was established in 1996, in order to foster links between those who have served in Her Majesty’s Ships of that name and also with the City of Chester. The Association is affiliated with similar associations through the Federation of Naval Associations under the patronage of the Commander-in-Chief Naval Home Command (CINCNAVHOME) and, as such, enjoys charitable status. Membership of the Broadsword Association is open to all ranks that served in any of Her Majesty’s Ships of that name who have paid and maintained their annual subscription. Annual subscriptions will ONLY be accepted by the Association in the form of a bank transfer payable via the Association bank account. Associate Membership is also open to direct relations of full member’s (current or deceased) families. Any such Associate Member would be Ex- Officio and would therefore not be able to cast a vote on any matter at AGM’s or on any other matter concerning the running of the Association. A 50% discount of the full membership annual subscription will be enjoyed by Associate Members. Associate Members’ annual subscriptions, also to be paid, by a bank transfer to the Association bank account. The Association is served by an elected committee whose members are elected/re-elected at the bi-annual meeting of the AGM. The Association is a non-profit making organisation of which the accounts shall be presented for verification at the AGM. The annual subscription should be set at such a level such that the costs of postage, printing, telephone calls and essential travel by members of the committee (i.e. for setting up of AGM’s and reunions) is covered with a small margin for contingencies and any deserving causes as agreed at the AGM. Such a margin should not normally exceed £500 in the Number One Account. A Second account shall be used to hold larger amounts of monies for the payments to caterers etc at reunions. A quorum of the committee is deemed to be the Chairman (or his representative) and a minimum of two other committee members. The President of the Association (an ex-Officio post) shall be elected/re-elected as and when it is deemed necessary on the understanding that the office holder may either request or be invited to stand down as the occasion arises. In view of HMS Broadsword’s (1979 – 1995) adoption by the City of Chester the continuing link with the City is regarded as crucial. Bi-Annual AGM’s & official bi-annual reunions shall be held at Chester with the permission of the City of Chester Council unless otherwise voted for by the membership or permission by Chester City Council is withdrawn. The Association may be wound up if that is the wish of at least 50 per cent of the current membership. Any funds held at the termination shall be audited and distributed among charitable organisations as stipulated by the committee. It was a new experience for a young boy leaving home for the first time. of Signals of “Pepperpot” fame. It was to be a trial as I was not expected to pass! exam in the waiting room at Holme Station, long gone by Beeching. able to be polite in the language of the Country I worked after retirement from the R.N..
Grandparents in Littlehampton Summer 1952.
in the age of political correctness). I was to learn of this implication later! would not happen today if there are any Grammar Schools left. My Lords must have been desperate. in the Navy as you have a Navy grip, congratulations we will send you your Railway ticket. Most of the others joined me at Fisgard. and a request to inform them on which train I would arrive on the 5th January 1953. Cornish Riviera 1030 ex Paddington. so I was not too disappointed. I then put into action the plan to watch my back! I had been briefed by my Father. designated train and would be arriving later in the afternoon. noting with interest the other locomotives bustling about. which he replied why did you waste money on a Telegram! The moral of the story is you win some and you lose some. Peter Phillips MX920235 Ships book Number 3103. Sir! It all started one November weekend in Hong Kong 1958, the PO EL and I had gone over to Kowloon on a rabbit run. As we walked up Nathan Road my legs started to swell up so it was a case of back to Ship. Saw the LSBA who told me to see the Doc, a National Service Lieutenant in the Morning, he would no doubt prescribe the usual Aspirin and that would be that. However I was told that I would have to go up the Peak to RNH as it appeared that I would need surgery in the matrimonial area of my body making my own way! Monday morning I went on the Peak Tram and presented myself to see the Surgeon, the surgeon very quickly said you do not need to see me but the Medical specialist. So having been checked over by him I was informed that I had perforated kidneys and had to be admitted immediately. I then went back to the ship to retrieve my kit ready to be admitted to RNH. I then had to get the sick bay to organise a Tilley to take me back to RNH. I thought that this would be no problem as by now I had risen to the dizzy heights of PO! I was told that I was not entitled to transport, but I argued my case and won. I later found out that my condition was so serious they had considered to fly my Parents out, so why the hassle over transport. I was admitted and put on a strict bed and diet routine, the latter being a bottle of milk one hour and the hour a glass of limers so you can imagine the affect on the milk by the limers, they changed me to Ribena and that was OK. After 3 weeks of the diet and countless jabs I had my first meal, a British Rail sandwich and a jelly, an absolute banquet! I had a 21st birthday cake made for me but not allowed to eat it. Christmas lunch was a choice between a piece of Turkey or Pudding. As February was looming up I asked about repatriation to the UK as the rest of the commission would be going home. It was decided I would go home on the Nevasa as bed case. Shortly before my departure, by this time I was allowed up for 2 hours a day so I asked the Doc if I could have one last visit to the China Fleet Club and to get some rabbits. This was granted on condition that I took taxis everywhere. I caused No 1 boy consternation in the CFC by asking for the Comprador, but only for a menu as a souvenir! I still have that menu at home. Having returned to my sick bed the next morning the Doc asked me if I had enjoyed myself and would I like to go again the answer was obvious, although the food was good in RNH the CFC food was better. Whilst I was swanning around in Hong Kong a Chief SBA had been to check on my state as to boarding the Nevasa later that week, when he found out I was down town he was heard to say that I did not need a stretcher or wheelchair I could damn well walk. I know that you are probably aware, that in those days our female compatriots were non military and treated as ladies. We always called Sister ‘Sister’ and of course God was Matron. During one of my two forays I bought a small Sharp Transistor radio with earpiece so that I could listen to Inspector West on Radio Hong Kong during Matron’s rounds by hiding under the sheets. One night she caught me and in a loud voice said haven’t you a little one there, the whole ward burst out laughing and I am not sure that she understood what she had said. To continue, I soon found out that Army run Hospital were not the same as ours, my first mistake was to call the QARANC captain Sister after all I had been doing that for nearly three months in RNH. I was firmly told to refer to her as Marm. I also found out that as a PO I could use the 2nd class lounge deck so I asked the Army Doc if I could spend one of my 2 hours out of bed up there. He said no as it was for NCOs only then being an Army run thing your rank had to be on display. He said was that my uniform hanging up above my bed. To which I replied yes and he said are you really an NCO, I suppose he was not used to the Tiffy advancement where at 20 years old you became a PO. The next problem on my first trip on deck, I could see this character in flamboyant Bermuda shorts, surrounded by minions, keep eyeing me up. Sure enough after a few minutes one of the minions came scurrying over demanding that the RSM wanted to know what I meant by being on the 2nd class deck. It gave a big sense of satisfaction to send the reply back I was fully entitled being a PO in the RN! The food was diabolical and I survived on Ice Cream smuggled out by the medical staff on the 21 day trip back to Southampton. The Army Doctor turned out to be an alcoholic and bearing in mind my medical condition he allowed me to draw my tot on condition that he had half! The Customs cleared me of all my ready cash at Southampton and I spent the first night in Rose Cottage in Haslar only to be resited in the medical ward the next morning. I hope it has not bored you but it does make a different end to a commission.